An Apatura iris, illustrated by Roger Vigurs. This stamp was issued in 1985. I admit I wasn't exactly sure where Tuvalu was (as a lifelong geography geek, these lapses annoy me) though I was fairly certain it was somewhere in the South Pacific. Tuvalu is a Polynesian island nation midway between Hawaii and Australia. It is about 180º west of the international dateline. Vaitupu is the one of the 'islands' - actually an atoll comprising 9 isles - with a current population of around 1,700, making it the second most populated of Tuvalu. The Apatura iris, also known as the Purple Emperor, is part of the Nymphiladae family (that also includes other emperors, the Monarch, fritillaries, and admirals). 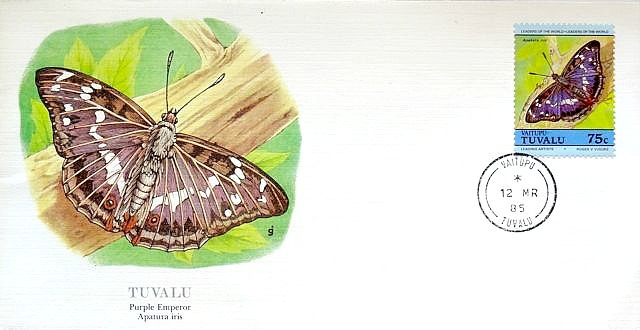 Despite the name, the females have a dull brown appearance with only the males having the purple colour (as seen on the stamp) though the iridescent purple can only be seen from a certain angle. The adults can have a wingspan of around 3". They spend most of their time in the tree canopy and unlike other butterflies they don't feed on nectar from flowers, instead enjoying a tasty meal from dung, urine and animal carcasses and a dessert of aphid honeydew and oak tree sap. Turns out they don't live in Tuvalu at all, but are found in the woodlands of Europe and England (but not Wales or Scotland). It is the second largest butterfly found in England and is apparently quite elusive. I found this interesting tidbit of the lengths people go to to find this beauty. oh my, this one is soooo beautiful!!! And from such a special and rare country! I wonder why they issued this stamp. Thanks for the geography lesson, I love the butterfly! Lovely stamp, and from such an unusual place. It is my goal in life to see one of these! They are not the rarest in Britain, that accolade belongs to the 'Duke of Burgundy' but as you point out they are the hardest to spot. They stay high and wont be tempted down with things like honey aphids. www.mark-pict.blogspot.com if I had more time I would collect stamps from Scottish Islands, just for the sheer joy of collecting them. Best wishes, Mark. "sheer joy of collecting" is the best reason, I think! thanks for your visit and comment. Very beautiful but why do they have a stamp of a butterfly that they don't have? Some strange islnad logic? maybe for collectors? a lot of small countries have themes that have nothing to do with their own country. Ooh, I just learned about the 'Todler Red' by Bob's post of today, which in Latin is named 'Apatura Ilia', and of which I also found the name 'Lesser Purple Emperor'. So the Apatura Iris on your stamp is family of the Apatura Ilia on Bob's Chech stamp! And indeed, I see often stamp series from countries who don't have the pictured objects in their own country at all, and of which I think they have been issued to be sold to collectors only. I only learnt about Tuvalu from a UK quiz show. 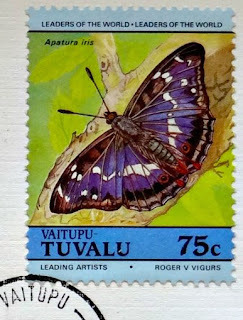 Lovely stamp and butterfly. Heleen has been bust this week.